Leizhan supply the whole paper manufacturing system as well as single paper machinery for paper plant. Cleaning equipment KH series low density cleaner is an efficient and high performance paper machinery and can highly benefit and improve the tissue paper and pulp manufacturing system of the customer. Leizhan KH series low density cleaner contain various types like: KH400, KH600, KH800, KH1000, KH1500. Leizhan engineer will supply the proper and tailored waste paper cleaning machine for paper plants according to various raw materials and production capacity. 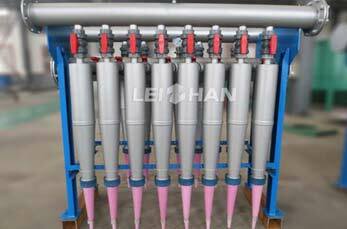 Material applied of Leizhan Low density cleaner: Main part applies to 304 stainless steel material, PVC valve, alumina ceramic bottom cone, alumina ceramic slag discharge mouth, diaphragm type pressure gauge, alumina ceramic end of stock saver. 1. Mainly used for removing heavy impurities in the pulp like gravel, scrap iron, dust and large ink particles. 2.Divided design, the cleaners can be divided into 3-4 parts ,which make it easier for disassembly, assembly and replace. 3. Different deslagging ways: open and closed type impurity discharge equipment. 4. The bottom of cone adopt wear-resistant ceramics, which ensures the stable deslagging and long service life.